In 2009, I received a useless college degree. Three years later, I graduated again with another useless college degree. You might be thinking “oh he majored in 12th-century art history!” (sorry art historians), but you’d be wrong. I have advanced degrees in accounting, along with an active CPA license and several years of impressive corporate experience…and I’m not using ANY of that in my current work. The owner of this blog, Bobby, also has college degrees that he hasn’t directly used in a few years now. Bobby and I are close friends with a number of other bloggers…most of which have college degrees and impressive experience…that they TOO are not using. We blog, freelance, and seek out contract work, and it’s absolutely vital that YOU start to learn these skills too. Your life depends on it. Before I dig into some actionable ways to better prepare you for the workforce of 2020 and beyond, it’s worth pointing out the impending danger and why it matters. This article is NOT about artificial intelligence taking over our jobs. Unless you’re in corporate finance or long-haul trucking. If that’s you, print this article out and tape it to your fridge. You’ve heard this, yes? Well as a millennial myself, I think this is…….absolutely true. The articles are popular because they’re true, like it or not. Corporate work, or what we’ll call the “industrial era,” is going out of fashion. In an age where updating a resume, chatting with a recruiter, going on an interview, AND getting a job offer…when that can literally happen in the span of a few days, it should be obvious that something has changed. A few days ago my blogger friend Steve got featured on CNBC. The headline? Bright, young, and passionate millennials (THAT’D BE YOU) need to start preparing for the coming work apocalypse. If YOU aren’t able to step up with the necessary skills and leadership, somebody else will, and there’s a great chance you’ll be stuck looking for mind-numbing jobs till you’re 75. The new education you need is accessible right this second, and in hearty supply. So HOW can we better prepare for the future? Remember when I mentioned my 2009 college degree and how useless it was? That was actually a lie. No, I’m not using my B.A. Sociology degree for a sociology job, and yes, there was a period of about seven years when I sincerely regretted getting a sociology degree. It turned out to be a wise decision after all, but not for the degree. The actual education turned out to be highly useful for everything I’m doing NOW. There are few people who actively take the time to analyze (in great detail) how the world around them actually works, specifically with regards to people. Customers, bosses, employees, VAs, readers, influencers. My “useless” sociology degree taught me a great deal about how to analyze and utilize these types of key relationships. That said, YOU should go back to college for sociology. The point is this: there are a number of soft skills, leadership skills, thinking skills, and advanced technical skills that can provide you powerful leverage in your career, whether that be in corporate America (but making a difference), freelancing or contract work, or just blogging full-time. This can be a fuzzy term, so let’s break down the specifics of what it means to be a great communicator: the ability to clearly articulate an idea with the intention to make change. Learning the art of persuasion. Mastering the art of getting noticed and standing out. Again, these skills are not those taught in a communications degree…they are acquired through experience. So unless your day job routinely gives you this experience, you’re missing out. Not advertising or mass marketing. As we become more and more immune to traditional advertising and mass marketing, the ability to reach people and connect in a NEW way is a highly sought-after skill…called marketing. Brainstorming key collaborations that will result in win/win situations for both parties. Engineering a viral giveaway that increases customer loyalty AND generates new leads. Building a quirky, unique, and niche brand that makes people talk. Generating powerful organic inbound through Google SEO or highly-targeted Facebook ads? Learn how to sell anything. We’re not talking about making money or scamming people with used cars. We’re talking about solving other people’s problems and overcoming the fear of rejection. Sociology is amazing for this. The ability to practice empathy and put yourself in the shoes of another human being is so powerful in the world of business (and life). Understanding the needs, wants, desires, and behaviors of other people actually makes it quite easy to effectively and sincerely solve their problems. And when you solve people’s problems, sales ensue. You don’t need to be a salesperson either, this applies to all careers everywhere. Sell website traffic on your content upgrade in exchange for their email address. Selling companies on your ability to deliver a certain freelance project. Selling your wife and letting you drop out of accounting to blog full-time. Specifically, the FEAR of rejection. There is only one way to learn how to deal with rejection, and that’s to get rejected. Over and over and over again. Facing disappointment for dismal results, getting ignored, and getting flat-out denied eventually build-up a superpower called confidence and resilience. You probably already understand how useful those traits are, no matter what you choose to do for a living. All tech skills not generally understood by older generations. Let’s be frank, working on computers is what we as millennials do. We grew up playing Sega Genesis and exploring those colorful iMacs. The ability to learn new software quickly is a fantastic skill to have for ANY new workforce in the future, and likely a skill you already have. The value is open to you now though. 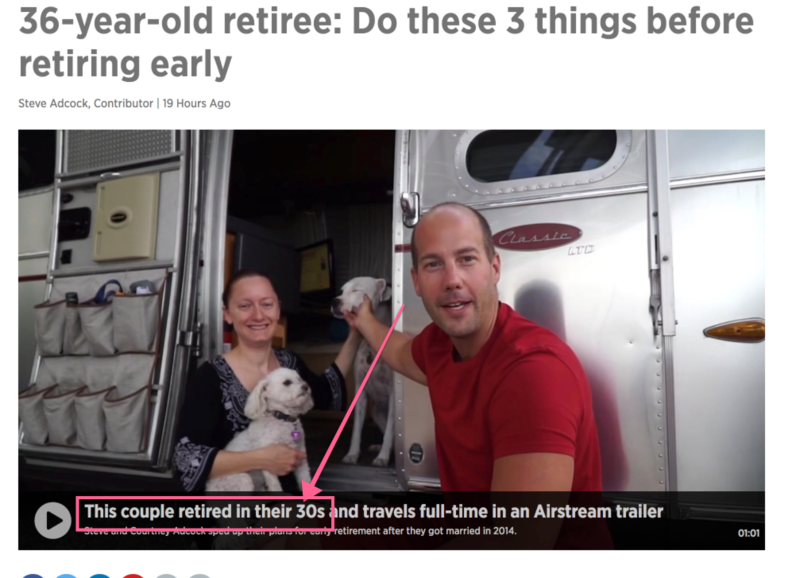 It’s the somewhat unique (if you think about it) ability to pick up on new pieces of software and tools, especially when it comes to the web…that really allows millennials to retire at 36 like my friend Steve. We can’t out-manufacture China. We can’t process routine work like India can. We can innovate and lead. We can and we must going forward. I’m NOT saying you should expect massive layoffs for American millennials in a few short years, but I AM saying the contract economy and small-town entrepreneurship model is already allowing people to better shape their own lives to their exact desires. And nothing is helping us do that more than passion. 14 months ago I left my corporate accounting job to pursue startup and blogging life full-time. I don’t have all the answers, and it’s definitely not an easy comfortable life right now. But I’ve also managed to make a living doing what I sincerely love (teaching other people how to blog for a living. How meta of me! ), and not a day goes by when I don’t get some sort of kind email or mention from somebody whose life I have touched in a tiny way. Now that other people in my hometown know what I do, I also get phone calls from businesses needing my services…services I would NOT have learned had I not started and failed with so many blogs and online businesses. The time for you is now, too. Start focusing on learning new and transferable skills, and start today. Your future might just depend on it. Pete is a full-time content creator, and interviews world-class bloggers at Do You Even Blog. He is launching Blogger U this week, a MEGA-comprehensive blogging education program helping people grow amazing blogs and learn amazing skills for the future. Please leave a comment below: What’s ONE skill you want to master in 2018? Pete gettin’ me all fired up as usual, I love it haha. I’ll be honest the fear of rejection and the fear of failure is a big thing. It can be paralyzing, debilitating. It causes most people to never even try something, and those that do try may never try again after a few failures. It’s something I still constantly struggle with and am trying to get better about. It’s uncomfortable. I don’t LIKE being uncomfortable, but I see the value in embracing uncomfortable situations to learn from them and make things better. That’s my focus area for 2018. Haha yes Pete is good at that! Interesting, I must admit as a guy who actually produced tangible products sold to millions of people I have trouble understanding how the new economy where people just sell services back and forth to each other (e.g. blogging, coaching, courses) won’t eventually collapse like a giant Ponzi scheme. It seems like a zero sum game and those almost always are disasters for most of the participants. That said I’m making a fair sum in my retirement offering consulting services which puts me in that economy too. I’m an engineer by training and I may well be seeing it in a highly biased way, in fact I am sure I am. I totally agree with your advice, if I hadn’t done most of that during my corporate career I would not being having the extremely meaningful and fulfilling slightly early retirement I am now. Great post and that advice isn’t just good for millennials it is good for X’rs and even for Boomers still working. Even when money is no longer the goal those transferable skills can make the difference between a retirement sitting on the couch watching television and a retirement that gives you a reason to get up with purpose! Always love your honesty “I don’t have all the answers, and it’s definitely not an easy comfortable life right now”. I can relate at this point in our blog. It’s stressful and can be very uncomfortable not knowing how the next 3 months will be income wise. The key is continually learning new skills, testing, and making adjustments. Best of luck with Blogger U. I think it’s going to be a hit for a bunch of bloggers. And I actually wish I could go back in this post and talk more about meta-learning. You and several others have mentioned it, and I think that’s spot on as well. I’ve seen nothing but progress and promise from the income reports you’e sent me, I’d say you guys are absolutely on the right track. I agree that continuing to use the “old guard’s” methods of job pursuits are largely ineffective. While I still feel that people fetishize Rich Dad Poor Dad a bit too much for my taste he was right about learning soft skills. My soft skills have served me far greater than the degrees and certifications I have. My biggest 2018 goal for my soft skills is to get a public speaking gig, not necessarily paid, outside of my current organization. I love public speaking and people seem to hate it less than most of my other hobbies so I might as well give it a shot, right? Great work Bobby! I feel sorry for Millennials sometimes as a Gen Xer as I think they have a tough environment to be thrust into. But then again, that’s from my perspective. Many Millennials seem to embrace it, understand it, and are thriving in it. Completely agree with this. Jobs aren’t going to all disappear, but I think you’re right that India and China are going to be willing to work harder than us for less money, so we have to learn to work smarter. Sales, communication and other soft skills are always going to be invaluable, while at the same time new “hard skills” such as programming, design and science are going to emerge to take the place of manufacturing, accounting, etc. Programming and design specifically seem to actually teach way more than just programming and design (i.e. how to logically visualize and solve problems…how to build things from scratch, etc). I still think I got enough out of my arguably useless university degree (history) to not regret doing it. There’s no way I would be blogging right now if I hadn’t taken a degree that focused so heavily on writing. I truly enjoy my day job so have no plans on escaping the grind, but I do think the opportunity to build side income and diversify your income sources is huge and more available than ever. Thank you so much for reading Sarah! This chimes with what I see professionally, loads of older people are so scared about redundancy, yet don’t seem to be willing to evolve their skills. There is a small group of people that are much more comfortable with change, they are happy to evolve, and know that in 10 years, 20 years time although their role may still exist, the actual tasks and knowledge needed will evolve. Thanks for reading Ms ZiYou! You hit some points that every millennial needs to hear RIGHT NOW. I also started out with a college degree I am no longer using, but it put me in a position to realize the same fact that you stated above. Our workforce is quickly transitioning into a contracting workforce. Turnover is higher in almost every type of work because we as millennials have a strong preference on the type of work we do, and who we do it for. Really enjoyed this. Got me thinking! I’d love to eventually transition into this kind of work but don’t know where to start when it comes to developing content or a brand. It is amazing how the fear of failure is such a common theme among people now a days! It is like we were told when we were younger that failure was a bad thing….which i guess it is, but the important distinction that seems to be missing nowadays is that nobody seems to understand you have never failed if you haven’t given up on yourself. There is unfortunately reality to deal with at times (yet…), but as long as we keep trying and aren’t literally insane, why can’t we come up with a new product/service, do what we want to, make an impact, or *insert other awesome idea here*?